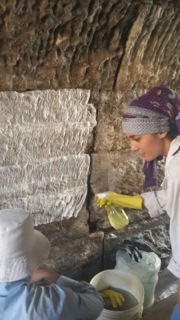 This summer was a good cleaning period for the Amman Nymphaeum. From a blackened relic, its frontal facade, niches and apses are absolutely restored again. Students, laborers and craftsmen are now working on its dirt-smothered back. The point has been to get it sparkling clean, if that term can be used for an architectural monument; they are well on the way to the next stage of conservation and then rehabilitation at the start of next year. First thing first. This summer, the nymphaeum, in the middle of bustling downtown Amman, not altogether a good thing because of the congestion, pollution and noise, was the scene of a working beehive. Everyday as bright as rain, sharply at seven o'clock, the restoration director Dr Mohammad El Khalili and his work team appear on site. 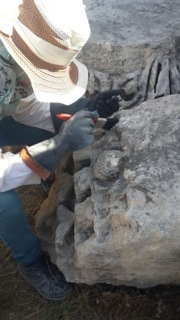 The Amman Nymphaeum Project is part of whole work team of experts in archaeology and restoration heritage, lab testing, photographical geometry and actual on-the-ground survey work. The two-year project is managed by Hamdi Mango Center of the University of Jordan financed by the US Ambassador's Fund for Cultural Preservation, in cooperation with the Department of Antiquities which owns the site and the Greater Amman Municipality. Dr Abeer Al Baab, Dean of the Scientific Deanship in Jordan University is also taking an active role. She serves as the Overall Project Director of the Amman Nymphaeum Project. "These are very exciting times for the Nymphaeum, as the first stage of the project is starting, you can see it by its clean structure and the work that is being done that is transforming the monument and restoring and conserving it to its former glory," Al Bawab said. An extensive amount of documentation is being made on the Nymphaeum project, including herbs and soil collection and 3-D digital scanning, The latter is provided by the Department of Antiquities and is being analyzed by Dr Yahya Alshawabkeh of the Queen Rania Institute of Tourism and Heritage in Al Hashemite University. 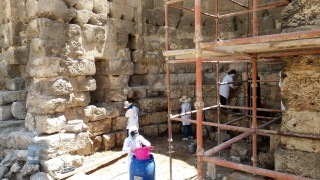 The work process at the Amman nymphaeum site started on 25 June. At any time since then, hordes of students were seen on the site with buckets of water mixed with sodium, clothes, sponges, metal brushes, soft brushes and tooth-brushes and tweezers dabbling at the walls, facades and stones of the structure. Dr Ramadan Abdullah, also a member of the team and working in the field with Dr El Khalili emphasizes the point. "Water is essential here. It is carefully mixed with sodium-hypo-choloride dowsed on the stones, with the brushing process to remove dirt and moss that accumulated over the centuries and millennium," he said. The Amman nymphaeum is made up of two parts, the lower includes a fountain and the barrel vaults while its upper part displayed the facade of the building, niches, walls and the vertical apses. The monument was built over a pool with running water in the middle of what is now as downtown Amman. "You can now see the tremendous amount of work that has been done, El Khalili said. "These elements were soot black, but now they are absolutely clean," he said. In addition to the clusters of soot, which have now been removed, the structure has been subject to staining, crumbling, chipping, cracking, and flaking. 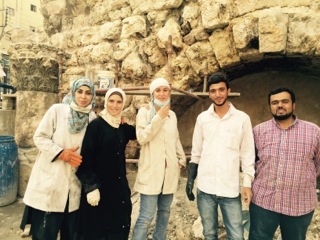 "These are being rectified through workers and craftsmen on the scene filling them then up with mortar to restore them to their original form," said Dr El Khalili - pictured left. Students move from one stone plank to the other in a continual motion, from one wing of the structure to its other. Others are on the scaffolding initially put up to support the structure and allow male and female students to clean its different parts. Once the job is done, the scaffoldings are dismantled and moved elsewhere. Students and workers are now at the rear of the Nymphaeum, as well as the vaults underneath. Photo: The scaffoldings now support the back of the nymphaeum. Students are upbeat. There is a camaraderie of relations that developed between the students, workers and craftsmen. 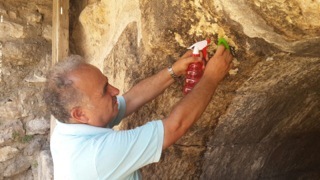 Dr El Khalili would issue simple instructions to them about the need to be careful and to use the "gentle touch" to be aware that this is a delicate structure in existence since Roman times and before, and thus the different stones need to be handled very carefully because too much pressure by the brush can result in greater crumbs and flakes from the stones weathering away. "Again, while students clean, the workers are busily making sand and limestone fills and filling the cracks and gashes on the walls," El Khalili said. 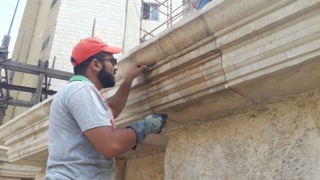 "During our work, this summer and which is still continuing, we have extended our hands and culture to the community as over 50 students, workers and craftsmen from different parts of the Kingdom like Amman, Madaba, Zarqa and Salt, and Jeresh," the field director added. Students are provided with essential experiences to find jobs in the marketplace. Rima Mansour, a Hashemite University graduate, is daily found on the site wearing a white coat and a hat under the blazing sun. "This kind of work provides me with greater experience and makes the possibility of getting a job in this field greater," she said. Maen Alhara is also a student who just graduated. With a hat on and a small bottle of drinking water, he moves from one part of the structure from the apses, walls and the vaults underneath that leads to the back of the structure. "Because of the location of the site with much pollution and smog from cars, part of our jobs is to remove the black crusts on the stones and edges of the structure," he said dipping for water from a nearby tank. Students, make use of plenty of water, using empty cans and beakers to pour lots and lots of water, drenching and soaking the stones. Sometimes they use the pressure pump to clean the stones. "The air pressure pushes the water out to make for better removal of the crusts of dirts, this however, must be used with the dabbing of water and literally scrubbing, so the dirt is eased out", he added. On many occasions Dr El Khalili was seen trying his hand at the pressure pump. 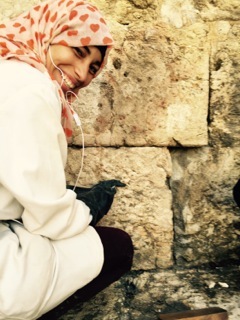 Dr Bawaab was also seen at various times trying her hand, demonstrating to the students the pressure of water on the stones as an additional element to remove the dirt. Students and workers were also seen hosing down down different facades, especially at the Nymphaeum's back with dirt water just gushing to the floor. All the team members move from one 'now cleaned up area' to the one to be treated. Scaffolding hoisted on the frontal apse, to the far left of what was a pool in its past glory, now boarded up under your feet. The elongated semicircular recess is badly in need of conservation and restoration. Students and workers split up, many climbing the scaffolding in the middle of the apse, starting to clean at its sides and center. Once the planks are readied they move to lower planks of the stones. There is a feeling of action everywhere, with many contributing, time is precious it seems for them. The process continues till the middle and the bottom. Male and female students are busy, in one part two girls are dabbling the stones with water and furiously brushing, at the other part another two girls doing the same; this time, using sponges and pieces of cloth and brushes. At the bottom of the structure decorative pieces and motifs with much carvings and engravings busily attended to through toothbrushes and tweezers to ease the moss out that had been built over the years and rolling centuries. In the pit there were students like Safa Younis, Lama Al Sharif, Lujian Waleed, Dana Al Showeiky, Dana Touqan and Rima Mansour. On the male side, were Ibrahim Al Barghouti, Maen Alhara and Thaer Alshawabkah. They were basically doing different cleanings measures. Next to them were the workers, including Khalil Al Jahran, Khalaf Al Koor, a craftsman, Naif Al Zibin Oqail Al Koor and Malek Ayasra. Some were either removing falling debris and planks while others were filling in the spaces with mortar. Barghouti and Alshawabkah were on top of a scaffolded column next to them. They were actually digging parts of a 'wrong' previous attempts at restoration made in the 1990s; they are now starting to fill the different worn out patches with a mixture of limestone and sand with the help of a craftsman. This on-the-ground 'cleaning campaign' is set to end at the beginning of the coming November. 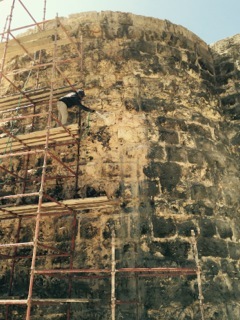 The pressure now is now on for the dirt-cleaning of the back facades of the Nymphaeum. Some areas have been cleaned, others are waiting their turn. Hopefully enough time would be left. Again with this going on, the craftsmen with their bucks of mortar are also moving to fill the gashes and crevices in deterioration because of the wear-and-tear of history. From then on the academic team will continue to document the project and write up their reports for early 2016 where another portion of survey work is expected to begin again. More on-the-ground work is in the pipeline awaiting the conservation stage of the Nymphaeum. Meanwhile, and although tired, the feeling of camaraderie sticks, especially in the afternoon. Just before they go home, after they wash and change their clothes, they gather around Dr El Khalili for different pointers on the day's work and what has been achieved to come back the following morning. As they pack up, a stone-mason from the DoA is sitting in the far-corner, chipping away at different stones. His job is to work with the craftsmen and Dr El Khalili to measure the chipped and warn out stones and carefully replace them. A facebook has been created for the project were many pictures are posted of the different work stages that are being done. For more information see (https://www.facebook.com/AmmanNymphaeumProject). The music sent waves of shock, thudding on and on, the songs kept coming, people dancing on the floor, hands in the air, shoes thumping to the beat. We were at an engagement party.